Bruschetta, at its most basic, is bread that is grilled and then rubbed with garlic and drizzled with olive oil. Topping these tasty toasts with fresh tomatoes makes a popular Roman antipasto, just perfect for the dog days of late summer. The simple flavors of the poached shrimp mingled with citrusy juice make a perfect finger food for a summer's evening get-together. 1. Drizzle the bread sliced with olive oil and grill or heat in a pan. 2. Saute onion, garlic, and shrimp in olive oil. Season with salt and pepper. 3. Add lemon juice, parsley, basil, cream and butter. 4. 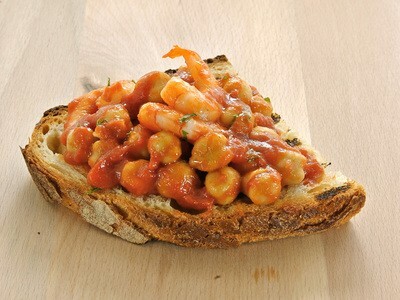 Spread 1-2 teaspoons of the cream shrimp on the baguette slice and top with sun-dried tomatoes.